Successfully Added Chuwi LapBook Windows Laptop - Cherry Trail X5-Z8350 CPU, 4GB RAM, 15.6 Inch FHD Screen, 10000mAh Battery, Win 10 Home Licensed to your Shopping Cart. Following in the wake of Jumper and Xiaomi with their successful compact laptops, Chuwi has launched its own rival laptop called the LapBook. Powered by an Intel Atom Cherry Trail processor with burst speeds pushing its quad-core processing power to a zippy 1.92Ghz and equipped with 4GB of DDR3 RAM this affordable offering from Chuwi brings you all the benefits of a laptop at Tablet PC prices. With 64GB of eMMC storage there's enough room for most needs but the addition of a micro SD card slot provides room for up to 128GB of further storage while USB 3.0 and 2.0 ports make it easy to add memory pens for further storage or controllers for gaming fun if required. Coming with a licensed version of the Windows 10 Home edition this Cherry Trail laptop will support the full Microsoft suite of software as well as a multitude of games and media so whatever your needs you will be able to get everything done on the Chuwi LapBook. A 15.6 inch screen delivers full HD resolutions which allow you to enjoy games, movies and media in stunning detail and quality. A nice addition is the mini HDMI port for when you want to use a big screen, making it ideal for presentations or sharing with family and friends. At 9 mm to 22 mm thick this wedge shaped laptop is ultra thin and weighing just 1.9kg it is a very compact and portable which is supremely impressive considering it houses a 15.6 inch screen. This sleek body also houses a surprisingly loud speaker that delivers quality audio to accompany the Intel powered graphics, or you can opt to use the 3.5mm audio jack if you don't want to disturb those around you. There is also a 2MP front facing camera that comes in useful for video chats and of course wireless LAN and Bluetooth 4.0 support to ensure speedy connectivity for downloading and browsing data online. Keeping all this running for hours on end is a 10000mAh battery that will provide enough power to watch a few movies or keep the Chuwi LapBook ticking for hours of gaming entertainment. With all things considered it is hard not to fall in love with the Chuwi LapBook as it brings remarkable performance and unbeatable prices and is sure to be a hot seller for Xmas presents and students alike who will find its value to good to pass up. 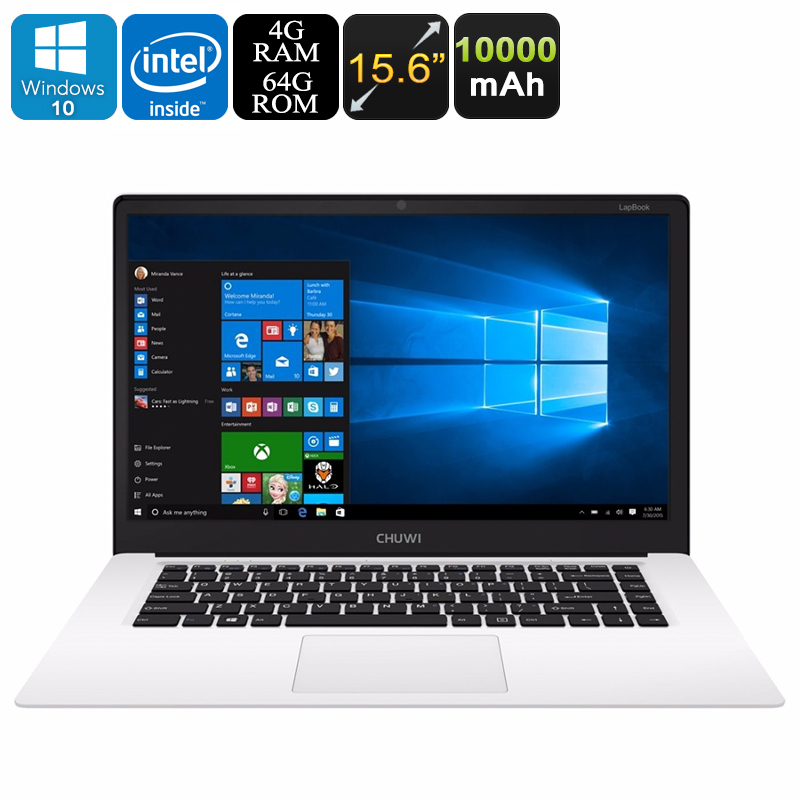 The Chuwi LapBook 15.6 inch Windows 10 laptop comes with 12 months warranty, brought to you by the leader in electronic devices as well as wholesale Windows Tablets and Laptop PCs..